A new year offers the perfect opportunity for a fresh start. If you feel that the appearance of your teeth is keeping you from achieving your personal or professional goals, now is the perfect time for a dental makeover! What does this involve? It all depends on what is bothering you about your smile. Teeth Whitening. This can be done in the dental office for the fastest results. Or, we can provide a custom-made kit that will allow you to whiten your teeth at home over the course of several weeks. Either way, teeth whitening can achieve dramatic results at a relatively low cost. Cosmetic Bonding. Small chips, cracks, or other minor flaws in teeth can sometimes be erased with a tooth-colored bonding material that is applied to the teeth in layers and then hardened with a curing light. Cosmetic bonding is a simple, in-office procedure that normally requires no anesthesia (numbing shots). Dental Veneers & Crowns. Sometimes, whitening and bonding treatments are not enough to correct certain cosmetic issues. 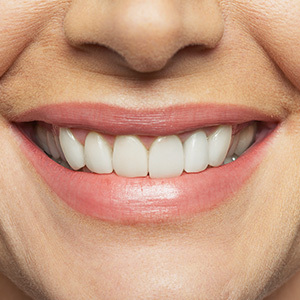 When teeth need a more significant alteration, dental veneers or crowns may be the answer. A veneer is a thin, tooth-colored shell that covers the front surface of the tooth, while a crown covers the entire visible surface, all around the tooth. Veneers and crowns can be created in a range of shades, from natural ivory to Hollywood white. Orthodontics. Crowding—a situation where teeth are too close together or out of alignment—is a common problem for middle-aged adults, even those who wore braces as adolescents. That's because teeth are not stationary in the jaw, but make minute movements in response to the forces of biting and chewing. Over time, they tend to drift towards the center of the mouth. Orthodontics can often correct this problem—and fortunately there is no age limit for treatment, as long as your oral health is good.